Just a call or text away! Our business is built on word-of-mouth marketing, and we believe anyone considering hiring us as their Realtor should be able to read the unfiltered reviews and testimonials of the clients that have come before them. We’re pleased to publish all client feedback, not just the glowing 5-star examples, and will only remove reviews that violate the policies listed below. We’ve worked with hundreds of clients since 2004, and will gladly try to help you get in touch with any of our past clients if you have questions about their reviews and feedback. Verified Client: We’ll only publish reviews from people that have actually used me as their Realtor. Conflict Of Interest: We won’t publish reviews from immediate family members or others who may have a conflict of interest in reviewing us. Private Information: We won’t publish reviews that include information that should be kept private, such as phone numbers. Foul Language: We won’t publish reviews that include obscene, profane, or offensive language. Illegal Content: We won’t publish reviews that include hate speech, discrimination, threats, personal attacks and the like. Nor will we publish anything that violates another’s copyright. Off-Topic Content: Reviews must be about the service we provided as a Realtor, and not about other aspects of a real estate transaction or about non-real estate matters. Spam/Promotion: Reviews should not include advertising or promotion of any kind. 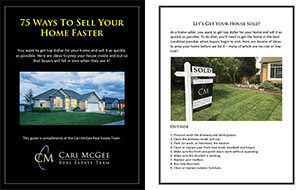 Get a free, no-obligation Home Valuation Report, which includes our 8-page guide, "75 Ways To Sell Your Home Faster." Already have an account? Login here to see your saved properties and searches. Proven results. Trusted advice. Local expertise. Experience you can count on. Delighting Tri-Cities real estate clients since 2004.